Nick Bibby’s sculptures are exquisitely observed. Rich with almost imperceptible subtleties; elevating his art from the merely good to that of a true master. Largely self taught; Nick has always pursued his own path, constantly pushing himself, seeking new challenges; ever striving towards the unachievable goal of, ‘Perfection’. Having won numerous accolades for his early miniature figurines sculptures, Nick soon moved on to the fast-paced world of freelance sculpting and modelmaking, for the advertising industry in London in the eighties, quickly gaining a reputation for excellence and the ability to achieve the seemingly impossible. Through it all, Nick’s abiding love of nature and the natural world shone out, and still drive his creativity today. In 1991 Nick produced his first limited edition bronze. A life size Kingfisher, which sold out within a few months, giving him the confidence to move over full time to sculpting and exhibiting bronzes, with his first one man exhibition, at the world renowned Wildlife Art Gallery in Lavenham, Suffolk, two years later. Nick now exhibits work regularly at Sladmore Contemporary, Mayfair, London, and Gladwell & Patterson, Knightsbridge, London, as well as several other galleries in the UK. In addition, Nick’s works have been exhibited at The Royal Academy of Art, London, The Mall Galleries, London, The Pinacoteca Giovanni e Marella Agnelli, Turin, Leigh Yawkey Woodson Museum of Art, Wisconsin, Sigurjon Olafsson Museum, Reykjavik and the Society of Portrait Sculptors, London, to name but a few. When commencing a sculpture, Nick starts with copious reference, first constructing a supporting metal armature that often closely matches the skeleton of his subject. He rarely does working drawings. Having researched his subject, Nick builds up a fluid mental image of the piece; a mutable, three dimensional image with no need to be translated into two dimensional drawings, only to be translated back into three dimensions as the finished sculpture. Gradually adding clay or wax to the supporting armature, Nick builds up the form, making constant minor adjustments to anatomy, composition and pose, always striving for the perfect aesthetic balance between realism and art. The variety of the ever expanding ‘Bibby’ sculpture collection; birds, animals, human and mythological, is constantly driven by Nick’s hunt for knowledge, new challenges and the desire to push his limits. In 1999 Nick Bibby was asked to sculpt a collection of life size, state of the art, scientifically accurate, bronze portraits of extinct birds and animals, native to the islands of Mauritius, Rodrigues and Réunion, including the most famous extinction of all – the Dodo. Bones to Bronze was sculpted in close partnership with naturalists and palaeontologists from the region. The sculptures were created to raise awareness of the species lost and the species we continue to lose worldwide, whilst also raising funds to support continuing conservation work on the islands themselves, through their sale. A complete collection is on permanent exhibition on Ile aux Aigrettes, just off the coast of Mauritius, and a Bibby Dodo is also on permanent exhibition in the Ashmolean Museum, Oxford, England. This particular Dodo has even inspired a children’s book! Nick’s wildlife subjects continue to be the mainstay of his collection, but in recent years his nationally important collection of British Champion Animals sculptures; documentary portraits of champion examples of iconic British breeds of horse, cattle, pig, sheep, dog and poultry, inspired by the collection of the same name, sculpted by Herbert Haseltine eighty years earlier, has brought further recognition and praise. 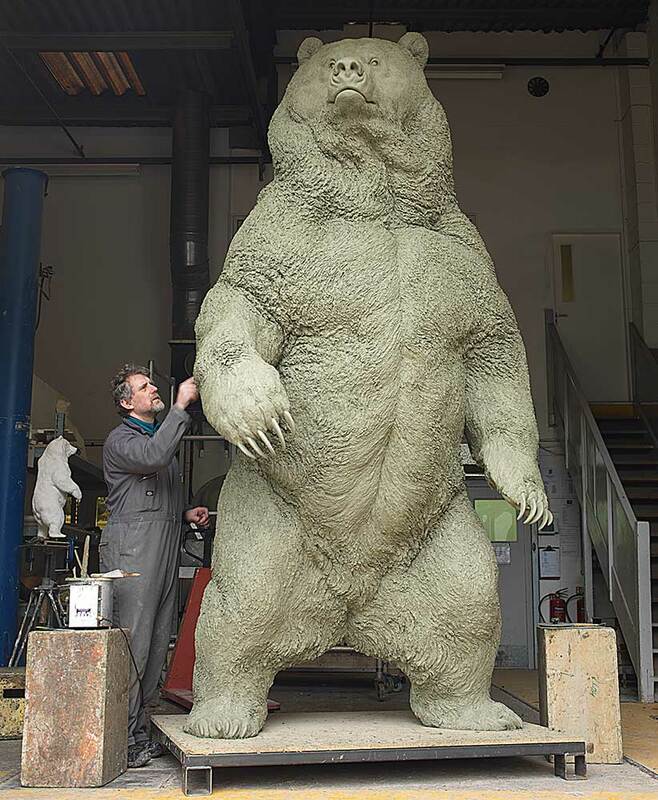 Indirectly leading to a commission from the prestigious Ivy League University, Brown, to sculpt a monumental, fifteen foot, Kodiak Brown Bear (the university’s mascot) which now stands outside the Nelson Fitness Centre, Ittleson Quad, on their campus in Providence, Rhode Island. 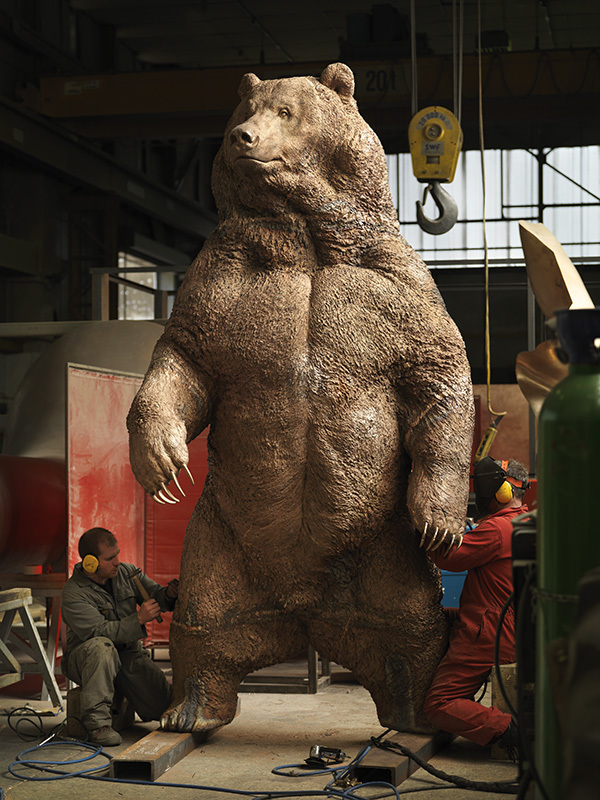 Called Indomitable, the giant bear was installed in 2013. 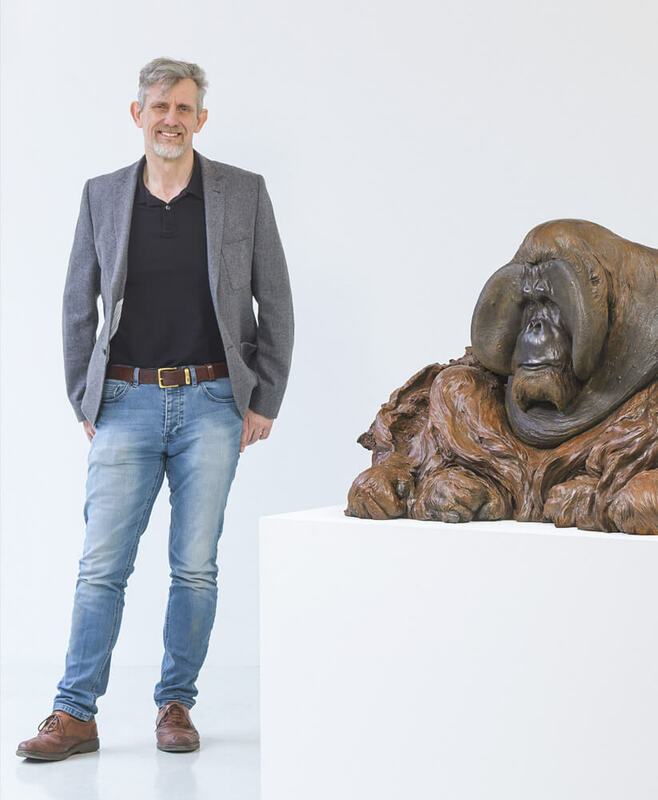 More recently, Nick has fulfilled commissions, for a smaller, Indian Rhino, also for Rhode Island; a nearly seven foot, heroic, classical, torso of the Greek god, Apollo and a life size Orangutan, for private collectors in the UK. Currently working on more wildlife pieces, Nick is always looking for new projects and challenges. All Nick’s sculptures are cast in small limited editions of between 3 and 25, by Pangolin Editions Foundry, Chalford, Gloucestershire. One of the best fine art foundries in the world, renowned for their skill, outstanding artistry, craftsmanship and commitment to quality. Pangolin cast each sculpture by hand, using the lost wax, or cire perdue casting method (with the exception of very large pieces which are cast using a hybrid, wax, sand, casting method). First used over 5500 years ago, lost wax casting remains essentially unchanged from lost wax casting in antiquity. It continues to be an almost magical, enormously skilled and labour intensive process. 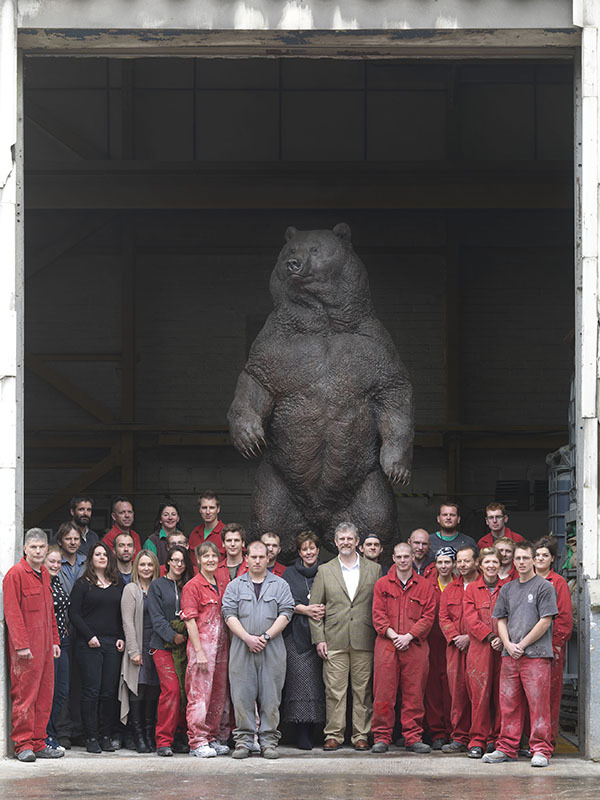 In addition to casting Nick’s sculptures, Pangolin Editions are chosen to cast the works of Damien Hirst, Antony Gormley, Lynn Chadwick, Dame Elisabeth Frink and Sir Eduardo Paolozzi, to name but a few. Nick has used Pangolin exclusively for over 25 years. It takes a foundry as exceptional as Pangolin to reproduce the extraordinary detail and subtlety of Nick’s original sculptures. Hand casting, finishing and patinating each sculpture is an incredibly involved and technically challenging process, requiring years of experience and many, many, hours of hard work by a team of highly trained and talented foundry men and women. The casting process begins when Nick’s original clay, or wax sculpture arrives at the foundry. A multi-piece mould of the original sculpture is made, using several layers of silicone rubber, with outer ‘jackets’ of plaster or fibreglass to support the soft, flexible rubber. Once the mould has cured, the mould is opened and the original sculpture removed. Next, the silicone rubber mould is used to cast a hollow wax copy of the original sculpture, made by painting repeated layers of special wax into each section of the mould, before reassembling the mould pieces and slushing molten wax inside the mould, to fill any gaps between sections. Once the wax has cooled, the hollow wax cast is removed from it’s mould, checked for any damage, or loss of detail, which has to be modelled back into the surface. A window is cut into the hollow wax sculpture, which is then filled with special plaster. A network of wax rods are joined to the surface of the wax sculpture. These will eventually become channels to feed in molten bronze and let exhaust gases escape during casting. Then the whole wax assembly is remoulded (invested) in more of the special plaster mix, which is able to take the high temperatures of the casting process. Once the plaster has dried, this ‘investment’ mould is gently heated in massive kilns until all the wax melts out of the mould, leaving a hollow void in the shape of the eventual bronze casting – hence, “Lost Wax”. 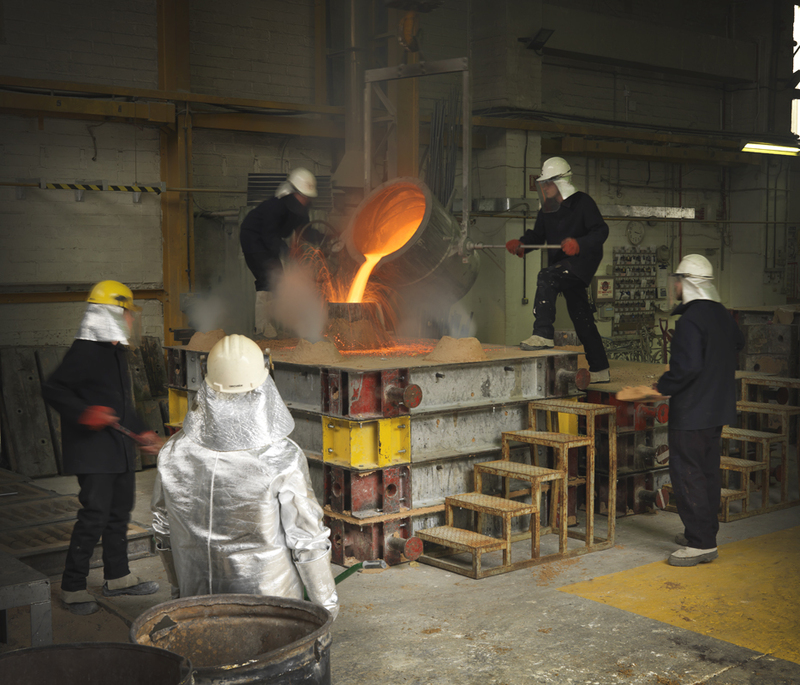 The next stage is to heat the bronze, until it is molten – over 1100 degrees C. Once the bronze is hot enough, it is skimmed to remove any impurities, then poured slowly and carefully into the investment mould. Once the mould is filled, it is left to cool, before the bronze casting, hidden inside, is carefully broken out of the encasing plaster, and the internal plaster core blasted out, using a high pressure water jet. To the untrained eye, the resulting bronze casting looks like a piece of scrap metal, discoloured and surrounded by a web of bronze rods, called runners and risers, attached to it’s surface – the casting feeds mentioned earlier. Next comes the metalworking stage. The bronzes are often cast in several sections, due to the complexity of Nick’s original sculptures, and these sections must be welded together, using the same bronze alloy used for casting. All the runners and risers must be cut away, and any pits or other casting flaws have fresh bronze welded into them. After this, the areas of fresh weld and any areas of lost surface detail need to be carefully carved and chased back into the surface of the bronze, exactly matching Nick’s original. Finally, the entire surface is given a thorough cleaning with wire brushes and solvent, to prepare the surface for the final stage – patination. Patination is the process of treating the surface of the bronze with special combinations of chemicals, that react with the surface of the bronze, building up layers of translucent, coloured oxides. Different chemicals react differently with the bronze and each other, to produce a huge variety of possible colour combinations. But it is not that simple! The dilution of the patinating chemicals, the composition of the bronze that they are applied to, the order in which the different chemical mixes are applied and the mixes used (they react with each other as well as the bronze casting) even the temperature and atmospheric humidity on the day that the casting is patinated can effect the final result. Once the layers of colour have been built up, the surface of the bronze is sealed and protected with multiple layers of protective waxes. This halts any on-going chemical reaction and seals the surface of the sculpture, protecting and preserving the patina. Bronze is a wonderful material; resonant with history; strong, beautiful, at times delicate, yet incredibly durable. There are 5000 year old bronze sculptures that look as good today as the day they were cast. Almost timeless in their beauty. Nick Bibby’s sculptures carry on that great legacy. If you would like to order a sculpture, enquire about availability, or commission something new, Nick would love to hear from you! Please use the Contact form, or look at our Ordering page for more information.